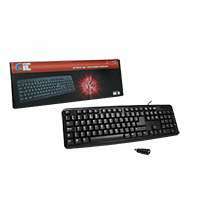 The CiT KB-2106C USB/PS2 is a wired Keyboard which is light weight and slim. This is a wireless keyboard that occupies only a fraction of your precious desk space, without any annoying cords. It has comfortable keys, a matte finish and low-profile keys ensure a smooth and quiet typing. Your most-used shortcuts, multimedia and other operations start at the touch of a button making it easy to operate. With a plug-and-play cable, no driver needed makes this keyboard easy to take this keyboard anywhere. The laser-carved characters, non-slip design, splash proof and durable make this keyboard last longer. The user-friendly, ergonomic design makes this keyboard very comfortable to operate. Quick control can also be achieved via the multimedia shortcut key operations. Supports operating systems from Windows 2000 / 2003 / XP / Vista / 7 / 8 / 10 / Mac OS.